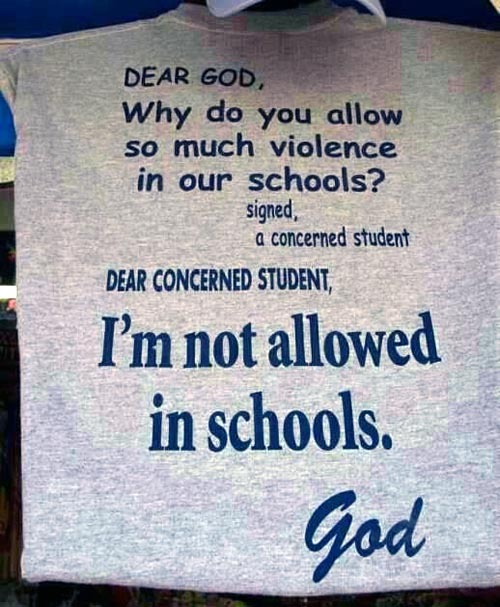 If the "loving" god who demands your worship isn't bright enough to correctly interpret the establishment clause of the United States Constitution, and is so petty and vindictive as to turn his back and allow the slaughter of 20 innocent babies, then I have no use for either of you. If you don't think teachers should be unionized but they should be armed, cancel basic cable. If more guns made things safer America would have the lowest murder rate on Earth. The NRA reminds you their right to shoot more clay pigeons without reloading is just a bit more important than your life. Welcome to America, where some of you will have an easier time buying an assault rifle than marrying who you love. Once, millions of Americans correctly argued the Constitution gave them the right to own other human beings, too. We changed. If the reason to have a thing is to protect yourself against people with the same thing, maybe that thing is a bad thing. It took two minutes, between 9:36am to 9:38am to kill 26 children and their teachers. How many hunters encounter 26 deer in two minutes? Too many conservatives refuse to regulate assault rifles, but they're fine with regulating the female reproductive organs. Because liberty. Sorry, but prayers and giving your kids hugs fix nothing; only having the balls to stand up to our insane selfish gun culture will. Categories: First Amendment, Mass shootings, Religion, Second Amendment, WTF?